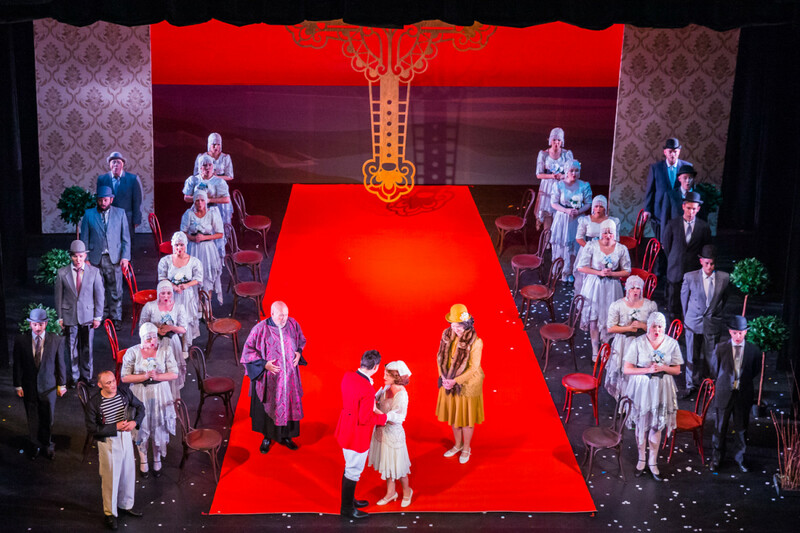 This summer the historic Frank Matcham designed Buxton Opera House, built in 1903 and seating 902, was host to the National G & S Opera Company which staged five new productions which will tour to Harrogate and other English theatres until the end of September. One of these was a comparative rarity: Ruddigore, which followed The Mikado at the Savoy Theatre in 1887. 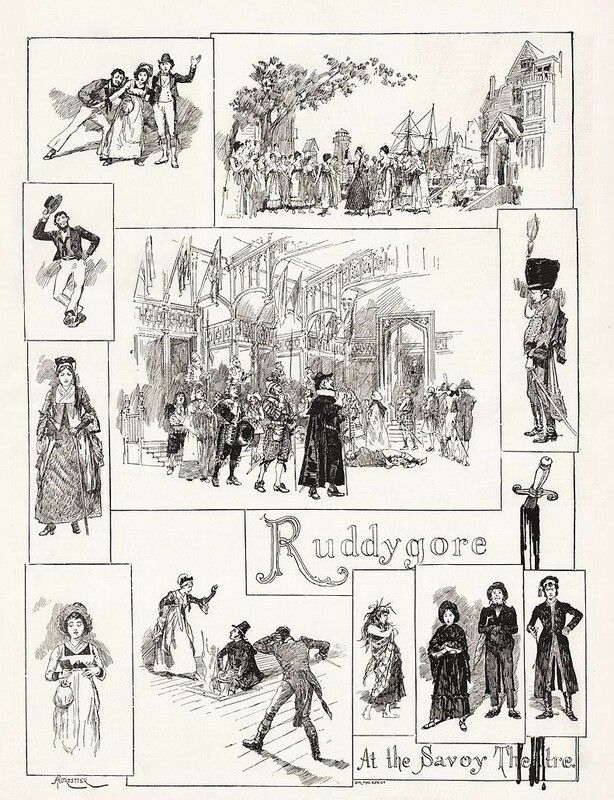 Originally spelt Ruddygore it was never going to be as successful as its predecessor and both Gilbert and Sullivan tinkered with it, without improving it, as did Rupert D’Oyly Carte when it was first revived after WW1. In this operetta, Gilbert was satirising the Dion Boucicault style of melodrama, with its stock characters, stylised dialogue and larger than life acting. In addition, Sullivan enjoyed himself pastiching Donizetti and Weber amongst other composers. Amédée Forestier’s illustration of scenes from “Ruddygore” in “The Illustrated London News”. Thanks goodness, then that this new staging had the benefit of a director, Vivian Coates, who understood the style in which the piece has to be played to give it full effect, and a cast more than capable of achieving that style, and what is more, clearly relishing it. 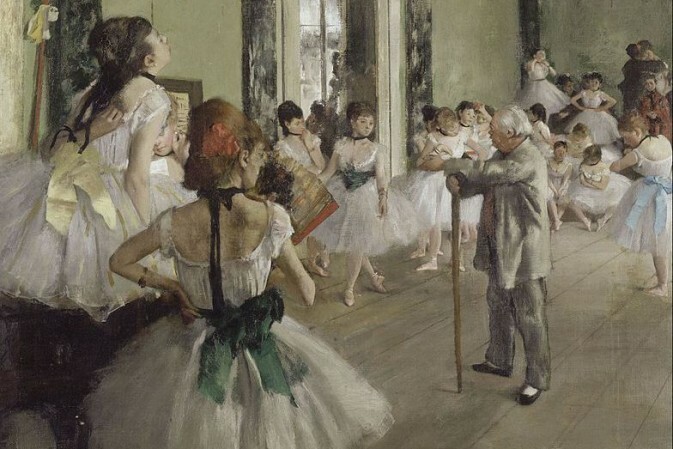 The opening chorus reveals a company of professional bridesmaids who are very miffed because their services have not been required for six months and they face potential redundancy! Enchanting costumes (David Morgan) and inventive choreography (Mary McDonagh) ensured an imaginative start to Act One. As in Pirates of Penzance, the contralto role, in this case Dame Hannah, is given the task of telling the audience the story so far – how and why there is a witch’s curse on the line of Murgatroyd. Luckily Gaynor Keeble had the acting skills as well as the enunciation to allow us to completely follow the plot – beautiful facial expressions, so in keeping with what is required in melodrama. Sir Ruthven Murgatroyd, the villain, who, as in all good melodrama plots is disguised as a young farmer, Robin Oakapple, was effectively played by Bradley Travis, who made a great impression in English Touring Opera’s Patience last year. Yet again he proved worthy of the role, being the ardent lover and then the evil baronet at the start of Act Two. Richard Dauntless (note the melodrama style names), who snitches on Robin forcing him to become the baronet because he loves Rose Maybud as well as Robin (I hope you’re following?) was amusingly played by tenor David Menezes, who can not only sing stylishly, with a Cornish accent, but also dance a hornpipe. Rose Maybud, the not-as-innocent-as-she-makes-out soprano heroine was Rosanna Harris: her dialogue was charming throughout as were her facial expressions, and her singing a delight, for example her first act song “If somebody there chanced to be”. It was instructive and essential to be able to hear all her words: perfect diction! 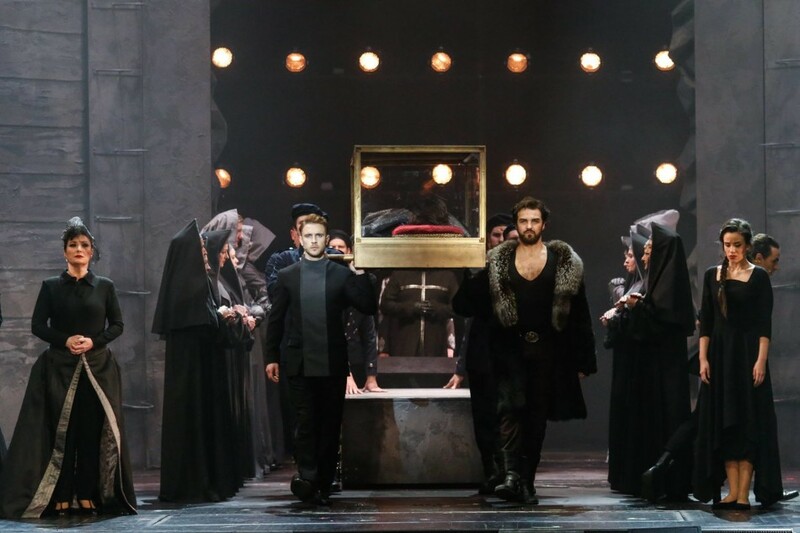 Sir Despard, Robin’s younger brother, and the current Bad Baronet, as he thinks that Ruthven is dead, was magnificently acted and sung with great gusto by Matthew Siveter. His opening song “Oh why am I moody and sad” was truly horrific – and funny! – as it should be, but too often is not! Mae Heydorn was an athletic Mad Margaret – driven to madness because her fiancé became Sir Despard and Stephen Godward made the secondary role of Robin’s servant Adam Goodheart much more dominant and amusing than it often is. Steven Page had great melodramatic fun as Sir Roderic who returns from the dead as a ghost to torment Sir Ruthven. A word of praise to for the two named professional bridesmaids, Alexandra Harris and Juliet Montgomery who used their faces and physicality particularly imaginatively. 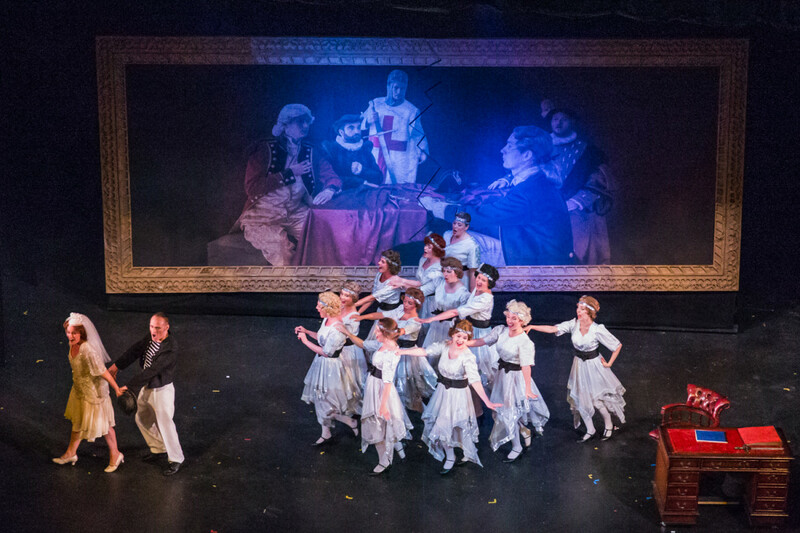 The director, Vivian Coates also designed the settings which were imaginative and had the advantage of ensuring that there was always a large acting space, often too large, as there are many scenes in Ruddigore involving few people and they were inclined, at times, to look a bit ‘lost’. On the whole, though, this was not only a very successful melodramatic evening, it was also hugely enjoyable and thoroughly recommendable! The energetic musical director was James Hendry, ensuring that the clarity of Sullivan’s orchestration was always apparent. It was a pleasure to hear some music that is often cut: for example an abridged version of the original overture (Geoffrey Toye composed a new one in the 1920s), the duet for Rose and Richard in Act One and the second verse of their duet in Act Two, as well as the original finale to Act Two. Without wishing to complain, it was a shame that Sir Ruthven’s patter song in Act Two (Henceforth all the Crimes I find in The Times) was omitted, as well as the first chorus to Dame Hannah’s song in Act One and a LOT of melodrama music for Despard in the Finale to Act One. Those wishing to hear this often omitted music should try to obtain a copy of the 2001 New Sadlers’ Wells Opera version on the TER label. Not only is this the best performance committed to LP or CD, in my opinion, it is also as complete as possible.